Murrayfield Racers’ newly appointed director of hockey, Tony Hand, has revealed the re-formed club still holds ambitions to play ice hockey at the highest level. Racers – once one of the most storied teams in the British game, winning six British titles between 1966 and 1995 – were reborn in April after Racers Leisure beat long-time tenant Edinburgh Capitals to the ice-time contract to play out of the city’s Murrayfield Ice Rink, but then failed in their bid to replace Caps in the UK-wide Elite League, spelling the end for professional ice hockey in Edinburgh. 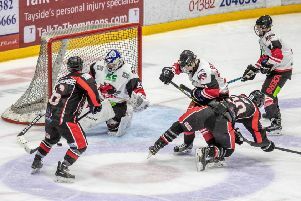 Racers will instead ice in the amateur Scottish National League, as well as participating in a round-robin season-long cup competition with semi-professional teams from the predominantly English-based National Ice Hockey League. Kicking off their preparations for the new season, which begin in the autumn, Racers hosted a meet-and-greet last week for local players and coaches, many of whom previously played for Capitals SNL. Hand explained: “Last week was about meeting with players in Edinburgh and explaining what we see for ourselves both now and in the future. And next month we’ll be hosting a fans forum at the rink, so that hockey supporters in the city can hear what we have planned. “One of our main aims is to put in place the foundation to give our young players a pathway to play at the highest level possible. Which means working closely with the junior teams already established at Murrayfield. Hand is Britain’s most decorated player and starred for the Racers in their heyday in the 1980s and 90s. He admits he was disappointed not to already see the reborn Racers in Britain’s top-flight but has vowed that the club aims to prove to organisations such as the Elite League that they are worthy of a spot amongst the professional ranks. “There are a lot of ice hockey fans in this city and we want to be playing at the highest level possible,” said Hand. “Our long-term aim is to see an Edinburgh team back in the Elite League, but we don’t have that opportunity right now. It’s definitely what we’re building towards and I’d like to think we’ll be back there in the future. “We want to show organisations like the Elite League that we can run a professional outfit. We’ve no axe to grind. They made a business decision and we respect that. Racers put out an early statement of intent by announcing former Capitals’ Elite League forward and fan-favourite Callum Boyd as their first signing, and Hand continued: “I’m under no illusions that this will be a tough season for our local players. They’ll be playing more games and participating in more training sessions than ever before. “The NIHL is quite a step up from the SNL and we will be competing in that for more-or-less half a season. We’ll be looking to bring in players from outside the local area to improve the depth of the team and we also have a chance to bring a couple of imports in that will improve the quality and help bring on our young players. “The response we’ve had from fans of the sport in Edinburgh has been fantastic. Hockey fans are beginning to move on and we’ve been really pleased with the number of people we’ve had looking to help us get things started.